You are here: Home / Biographical Adam Info / Friends and Relatives of Adam Lambert / Happy Birthday Sauli! Just a quick note to say Happy 28th Birthday to Adam’s boyfriend Sauli! Hope you guys have a blast tonight! If you hear what they did, post it below! 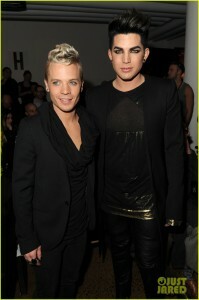 The attached picture of Adam and Sauli is from the Blonde’s fashion show. What a hot couple!!! From a distance Sauli looks like Pink’s sister. LOL. Adam could do better in my opinion, but I’m used to Sauli being in the picture. They seem to have a good relationship. I think Sauli must be the perfect yin to Adam’s yang. They appear to be making their relationship work, through all their challenges. Bravo!